Definition - What does Fallen Angel Pose mean? Fallen angel pose is a challenging arm balance and inversion, where the temple rests lightly on the ground. 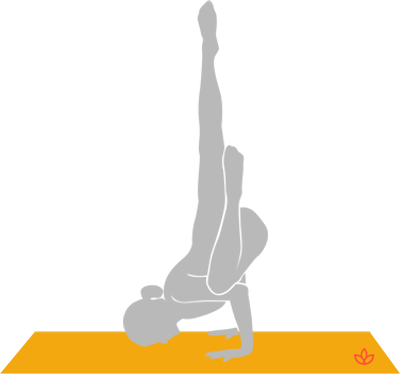 It is entered from side crow pose, by lowering the side of the face to the ground, then lifting the legs so that both feet point toward the sky. The fallen angel yoga pose is a powerful posture because it requires flexibility in the torso to twist the body, and strength in the arms and core to support the body weight and lift the hips and legs. Fallen angel also demands openness in the hips. This fallen angel pose is a beneficial pose for cultivating strength, balance and awareness. The Sanskrit name for fallen angel pose is devaduuta panna asana. Builds strength in the arms, shoulders and wrists. Improves balance and body awareness. Improves spinal flexibility and the health of the back. It's important to only attempt this challenging variation of side crow once crow can be held confidently and one has developed the arm and shoulder strength to lower the head to the ground with control. The temple should only be lightly placed on the mat, with none of the weight on the neck. It's possible to prepare the body for fallen angel pose by performing supine twists, hip-opening postures, and postures which activate the muscles of the arms such as chaturanga.